Backcountry flying is a specialized activity, but it’s nothing to be intimidated about, especially if you know what equipment you may or may not need, where you can find accurate information, and backcountry-specific safety tips. Home » Aviation Articles » Travel » Back Country » Backcountry Flying: Everything You Need To Know to Get Started! Many pilots find backcountry flying highly rewarding, and so can you. Have you noticed? Backcountry aviation is becoming more popular every year. Past AOPA President Craig Fuller got bitten by the bug, bought a Husky, and began showcasing Montana’s mountains in AOPA Pilot. Current AOPA President Mark Baker swears by backcountry flying in his Super Cub. Even veteran aviation editors Thomas Haines and Robert Goyer, better known for flying, respectively, a Beechcraft Bonanza and a Cirrus SR22 (that is, when they’re not test-flying the latest bizjets) have lately gone bonkers for backcountry aviation—Haines tooling around with bush pilots in Alaska and Goyer trying out the new XCub and threatening to buy his own backcountry bird. Organizations like the Recreational Aviation Foundation (RAF), Idaho Aviation Association (IAA) and Utah Back Country Pilots Association (UBCP) are being recognized for the vital work they have done to keep existing backcountry airstrips open and well-maintained, and even open new ones. Aside from magazine coverage, word of mouth is spreading. Why? Because there’s simply nothing else like taking off from an urban airport and flying to the mountains, ducking into a deep, twisty canyon, and plunking down onto a grass strip beside the river. You shut down, hop out, and breathe deeply after that exhilarating landing. Instead of car exhaust or smog, you smell pine needles on the brisk, clean air. The only sounds are the singing of birds and the flow of the river. In a flash, you’ve transported yourself from the stress of city life to a veritable paradise. What an accomplishment! So how do you do this backcountry-flying thing successfully? Backcountry flying is a specialized activity, but it’s nothing to be intimidated about. 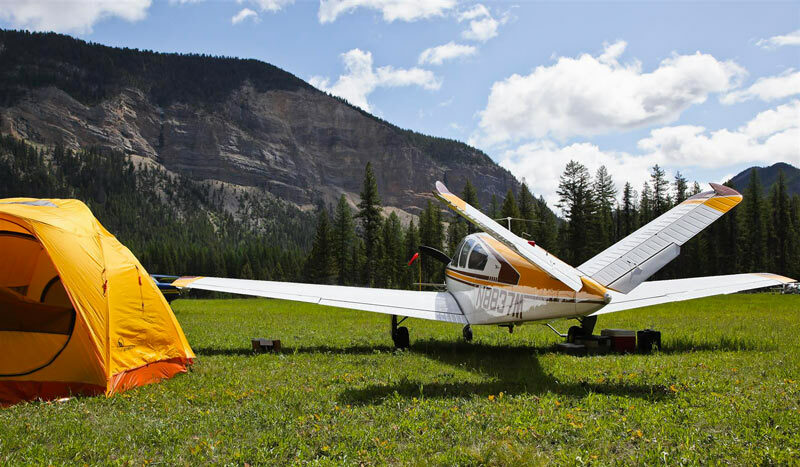 Let’s look at what equipment you may or may not need, where you can find accurate information about backcountry airstrips so you can decide which ones to visit, and backcountry-specific safety and etiquette tips. First, do you need a specialized backcountry airplane to fly in the backcountry? No! I know of two dedicated backcountry pilots, one in Montana and one in Idaho, who each own and fly a V-tailed Bonanza into remote backcountry airstrips. Another pilot I know flies a turbo Cessna 210, and my husband and I have flown a normally-aspirated 210 into a number of challenging and remote strips. So much for thinking a retractable can’t land in the backcountry! Certainly a Super Cub, Husky, Carbon Cub or other STOL-specific airplane can get into much shorter, rougher, and more demanding areas (assuming the pilot has the requisite skills). And a low-slung airplane like a Mooney is better off at a longer, well-groomed airstrip with easier approaches. So how do you find the right airstrip for your airplane, your skill level, and your interests? Bonanza at Meadow Creek, Photo by George Kounis. Common sense and FAR 91.103 dictate that you have a particular destination in mind before setting off. The FAA says “Each pilot in command shall, before beginning a flight, become familiar with all available information concerning that flight.” In choosing which backcountry airstrip to land at, your selection should be commensurate with your skills and the aircraft’s performance envelope. Every flight starts with a plan, and there’s a wealth of backcountry-specific information out there if you know where to look. Two of the best states for backcountry aviation in the lower 48 are Idaho and Utah. Why? Southeast Utah’s redrock country is loaded with remote airstrips. Many of them were initially built adjacent to mining areas; aircraft were used to bring people and equipment in and out. They tend to sit atop high bluffs or in canyon bottoms beside rivers. Idaho, however, has the greatest number of backcountry airstrips of any state in the lower 48. Central Idaho is mostly composed of steep granite mountain peaks and deep canyons carved by rivers like the Salmon. Even today, few roads cross central Idaho. Airstrips have often provided the only way, other than horseback, for firefighters, miners, loggers, fishermen, hunters, and private landowners to get in and out of the rugged landscape. Much of central Idaho became federally-designated Wilderness in 1980, but Idaho pilots banded together to keep their wilderness airstrips open. The best sources of detailed, accurate information about virtually all the available airstrips in Idaho and Utah are the books written by Galen Hanselman, entitled Fly Idaho! and Fly Utah! These are the books you’ll find in virtually every backcountry pilot’s cockpit. The Third Edition of Fly Idaho! was released in 2015. It’s a massive 946 pages, split into two volumes, Air and Ground. You can use Fly Idaho! and Fly Utah! to decide which airstrips you’d like to visit, based on your interests, skills, and equipment. Both books are set up the same way. In a nutshell, the books provide color photos of each airstrip that show what it looks like from the air, with runway numbers superimposed. Pertinent information like runway length, elevation, condition, slope, and surrounding terrain, are shown in text and diagrams. Using all this data, Hanselman establishes a number between 1 and 50 (called the Relative Hazard Index) to allow you to rapidly assess an airstrip’s difficulty. You’ll also find photos and descriptions of all there is to do at that airstrip: fishing, hiking, hot springs, a lodge if there is one, camping information, plus something that only Hanselman can provide: stories and history, often hilarious, about Idaho’s (or Utah’s) unique backcountry characters. Miners, early aviators, murderers, swindlers, ladies of the evening, you name it and you’ll find it in here. This section makes entertaining reading—pull up a chair by the fire in winter when your favorite strips are snowed in. Both books are available on the author’s website. There’s even an Idaho Backcountry User Waypoints Database you can download into your ForeFlight. Another extremely useful tool when planning your backcountry adventure is a VFR chart. The problem is that many backcountry airstrips are not shown on FAA charts. To their credit, a number of state aeronautical divisions have commissioned special full-state VFR charts, including Idaho, Montana, Utah, New Mexico, and others. They’re also the work of Hanselman, the author of the books above. Lay out the chart and you can see the entire state at once (they’re at WAC scale) plus all the significant airstrips, including dozens that aren’t shown on FAA charts. Folding charts are made of a special tear- and water-resistant material, and wall charts can be framed and hung on the wall. I have my Idaho and Montana wall charts framed right next to each other in my office and refer to them often. The Idaho folding chart is available for $10 on the Idaho Aviation website. The folding Montana chart is free for out-of-state pilots ($5 for Montana pilots) by calling Montana’s Aeronautics Division at 406-444-2506. Hanselman sells the Utah folding chart and Montana and Idaho wall charts on his website as well. With the charts and books, you should be able to choose which airstrips your skills and equipment can handle, and make plans to visit them. 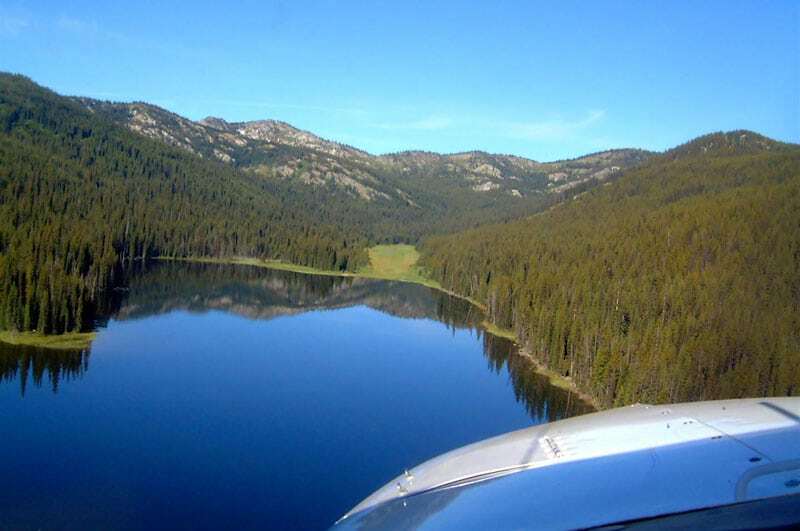 Here’s another Idaho-specific resource: The Idaho Airstrip Network (IAN) has a system of PIREPS, often with photos, showing recent conditions at many Idaho airstrips. Go to the Idaho Aviation Association (IAA) website and click on “Idaho Airstrips.” Then you can look at photos of a particular airstrip and read condition reports. After your trip, you can make a PIREP there yourself and upload your photos, much appreciated by others. If your destination is in Utah, the Utah Back Country Pilots Association’s website provides data and recent reports on many Utah airstrips. In Montana, the Recreational Aviation Foundation (RAF) provides information about numerous airstrips, including Ryan Field, where you need to request a safety briefing before landing. Because the RAF is a national organization, they also have information about airstrips in other states, like Blackwater Airfield in the Florida panhandle, or the newly opened Ragmuff airstrip in the privately-held North Maine Woods. But in choosing your destination, you should also consider this: Is your destination appropriate for the types of activities you have in mind? Are you flying in to stay overnight, perhaps for a little hiking or fishing? Or are you flying with a group of other aircraft, for a fun social event? Certain Wilderness airstrips are not appropriate for group fly-ins. Think about it: when you go out with your friends to have a good time, would you go to a library? No, you’d go to a bar, restaurant, nightclub, or private home. Loud behavior (and planes are loud) can be A-OK in one place and not another. Particularly sensitive are Idaho’s “Big Creek 4” airstrips: Mile Hi, Vines, Dewey Moore, and Simonds. Located on U.S. Forest Service land within a Wilderness area, they were closed to all but emergency use, meaning you couldn’t plan to land there. Through negotiations with the IAA and the Idaho Division of Aeronautics, the strips were re-opened for “sporadic” use—a group of airplanes doesn’t fit that description. Usage has increased beyond what the USFS considers sporadic, particularly during fly-ins with pilots seeking to challenge their skills and equipment. 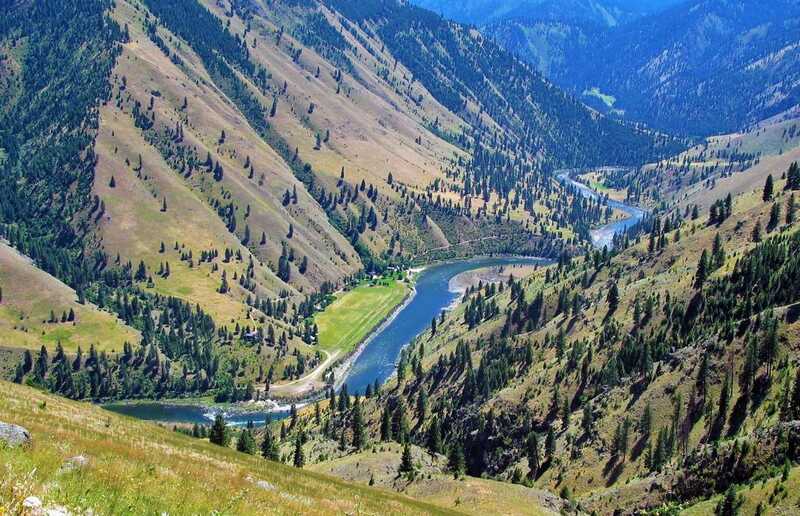 Perhaps the same should apply to those labeled “Wild.” If you want to land at a challenging, remote strip on the Salmon River with a group of aircraft, don’t drop in on Wilson Bar—save that strip for those who seek solitude. Instead, call first and then bring your whole group to Mackay Bar, a challenging airstrip just one mile downstream, but on private land, and with a lodge. The quintessential backcountry destination is a short, challenging airstrip beside a river, deep inside a canyon. Idaho has plenty of those for pilots with the skills and equipment to safely operate in such conditions. And the day usually ends with camping, relaxing around a fire and looking up at the stars. Some people, however, really dislike camping and that alone keeps them out of the backcountry. When you land at a Wilderness airstrip, the Idaho and Montana Pilots Associations, the UBCP, and the RAF all support the Wilderness airfield usage principle known as “Wilderness-related.” That is, using the airstrip as access for Wilderness-dependent activities like camping, hiking, photography, study, or hunting. If you haven’t already, consider joining one or more of these associations, dedicated to preserving backcountry aviation for all, such as the Idaho Aviation Association, RAF, Utah Back Country Pilots or Montana Pilots Association. Backcountry and mountain flying take specialized skills. If you’re new to backcountry flying, consider instruction from Idaho’s McCall Mountain/Canyon Flying Seminars 208-634-1344, or Mountain Airdance LLC in Helena, Montana. 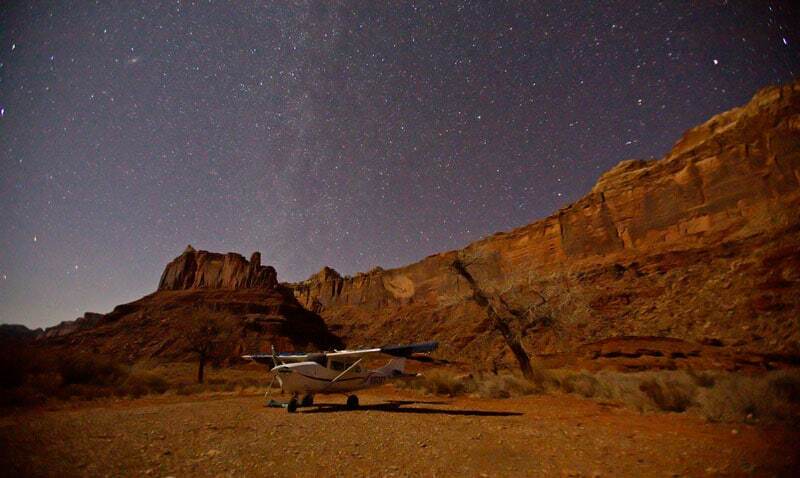 In Utah, Redtail Aviation, at Canyonlands Airport near Moab, has instructors familiar with the Utah backcountry’s unique challenges, 435-259-7421. You’ll learn the piloting skills and etiquette required to successfully explore the backcountry and properly enjoy backcountry flying. Once your destination is chosen, as with any flight, check weather and NOTAMS before departure. Former Idaho Aviation Association (IAA) District 3 Director Wayne Thiel says Idaho pilots check winds aloft at 9,000 feet MSL; if they’re above 20 knots, they’ll usually stay home. Big bumps over the mountains and tricky canyon drafts can be dangerous and take the fun out what should be an enjoyable flight. My experience has been that it’s rarely too windy two days in a row. Mountain obscuration is an obvious no-go. NOTAMS can warn of field closures or TFRs from forest fires. The TFRs are there to keep you away from smoke and fire-fighting aircraft. You can use the FAA’s TFR database, and I usually check Sky Vector because I like the way they overlay the TFR onto a sectional (winds aloft and areas of convective activity can be shown too). On approach to Fish Lake, Idaho. Photo by Dan Lilja. If you don’t file an FAA flight plan, give someone at home your itinerary so a search can be commenced if you don’t return on time or update with a change of plans. In addition, it’s smart to carry a satellite tracker or PLB. I’ve used a DeLorme InReach model and found that I could send and receive text messages where cell phones had no service, plus, the InReach showed my position accurate to within 12 feet. Enroute, monitor 122.9 MHz and make occasional position reports. Avoid unnecessary chit-chat on this universal frequency. The IAA recommends 122.75 MHz for other conversations; some pilots use “fingers” 123.45 MHz. Cross ridges at a 45-degree angle in case you need to turn back. Fly the right side of canyons when practical to help avoid mid-airs. Flying to the side also gives you more room if you need to turn around. If downdrafts prevent you from staying to the side, maybe it’s too windy for a safe landing. It’s critical to understand drainage when you’re flying in a canyon. Be aware of whether you are flying upstream or downstream. If you are following a river downstream, you know the terrain ahead will always be lower and the river will continue downstream. If you are following a river upstream and become lost, consider this an emergency! A box canyon might be just around the next bend. Turn around and then climb until you are out of the canyon at a safe altitude where you can sort things out. This article is intended as a guide to help pilots get ready to begin thinking about landing in the backcountry and not intended to replace formal instruction from a qualified CFI. If you land into a headwind on a one-way airstrip, the tailwind on departure may be unsafe until early the next morning when winds are usually calm. Especially in summer, this is the typical rhythm of a backcountry outing; you arrive in the morning, enjoy outdoor activities on the ground for a day or two, and depart again in the morning. If you can’t stay overnight, it may be safer to find an airstrip where you can take off in either direction. Check density altitude and your POH before departure; the soft surface will increase your ground roll distance. Uphill or downwind departures are best avoided. If you must choose between the two, CFI-I and former IAA President Jim Davies’ own rule of thumb is to depart downhill and downwind, unless the tailwind is over 15 knots. On both takeoff and landing, beware of sinking air over lakes or rivers. Early-morning wet grass can be slippery. The Montana Pilots Association’s Code of Ethics reminds pilots to always keep their aircraft’s noise signature to a minimum. In cruise, maintain at least 2,000 feet AGL for safety and to limit noise over sensitive areas. Always overfly the strip to check for winds and obstructions but avoid unnecessarily “buzzing the field” or face an unhappy reception from others after you land. Most of the time, it’s best to fly a real pattern if at all possible. 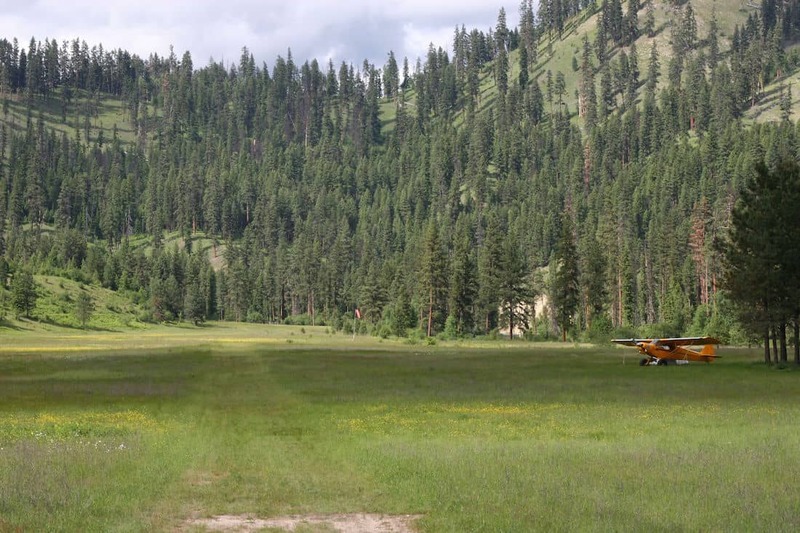 The Idaho Division of Aeronautics has published a series of excellent Standard Operating Procedures for some of Idaho’s most popular airstrips: Johnson Creek, Smiley Creek, Cavanaugh Bay, Big Creek, and Garden Valley. It is also not appropriate to practice touch-n-goes or multiple landings in the backcountry; it causes too much noise and wear and tear on the strips. Pilots with constant-speed propeller aircraft can use lower RPM settings to reduce noise; try to avoid low, power-on approaches. Judicious use of power while taxiing is vital for many reasons. You don’t want to fling rocks into your prop. Prop blast increases erosion on the strips and they are not easily repaired. It’s also rude to others. One pilot, camped beneath his wing, had several folding chairs blasted into the side of his aircraft. A taxiing pilot blew a tent—fortunately, his own—20 feet away from the campsite at the Cavanaugh Bay airstrip. That airstrip, incidentally, was temporarily closed because someone created deep ruts by landing when it was too wet. The Mexican Mountain airstrip in Utah had just been re-graded when two pilots landed on it after heavy rains. When the strip dried, the ruts were so hard it took volunteers many hours to repair the damage. Other recommended supplies are duct tape, bug spray or nets, extra food and water, first aid kit, warm clothes, tent and sleeping bags or blankets, small tool kit, axe or hatchet, small shovel, tire-repair kit and pump, Leatherman or Swiss Army Knife, engine oil, brake fluid, and paper towels. Most backcountry flying is done in summer and smart pilots fly in early morning for cool, calm air. It’s understood that pilots will get up and depart early. Nobody expects to sleep in, but an endless, high-power runup in the backcountry is impolite. In cold weather (though not in Wilderness areas) Todd Peterson of Peterson Performance Plus uses a quiet Honda EU-1000 generator with a Reiff pre-heater on the cylinders and oil sump. One hour later in 17-deree weather the cylinder temps are in the mid-40s and he’s good to go without an engine warm-up. Tie it down securely in the aircraft. Milky Way above Mexican Mountain and Cessna 206. Photo by Mike Hart. Many pilots find backcountry flying highly rewarding, and so can you. Fly to a remote strip and enjoy fly fishing, far from the crowds. Or bring your camera to capture the beauty of a mountain sunset, or the majesty of an enormous moose. If you’re super lucky, you might be treated to a nighttime serenade by a distant wolf pack, or a pair of owls in the trees above. Or just revel in the complete quiet of the Utah redrock desert, as the Milky Way glows above you like you’ve never seen it. Then share your good fortune and bring someone along when you go backcountry flying who might otherwise not be able to visit these beautiful places. This is a good article on back country flying. I’ve been an aficionado for many years, and have seen some very bad and/or unsafe behavior by pilots. Before heading for the back country, fly with an experienced instructor to learn proper techniques to avoid bending your airplane, or worse, yourself and passengers. Wow, this is for me!. Here in England we have no space for this kind of thing. Early days but I’m going to do this. Thanks for great article. This is just what I was looking for. Something to get me started on what to do in retirement.